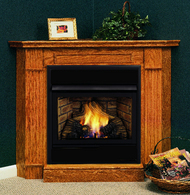 The Monessen Symphony 24 vent free gas fireplace with Corner Surround and Hearth will provide the heat and beauty of a traditional fireplace with the convenience and flexibility of a compact, slim design for installation almost anywhere in your home. The Monessen Symphony 32 vent free gas fireplace with Corner Surround and Hearth will provide the heat and beauty of a traditional fireplace with the convenience and flexibility of a compact, slim design for installation almost anywhere in your home. The White Mountain Tahoe Deluxe Series Direct Vent Gas Fireplace features a Contour tube-style burner, designed to compliment the hand-painted ceramic fiber log set, and produce a natural dancing flame. The Deluxe series comes standard with with louvers (top and bottom).